In terms of brand recognition, it’s hard to top a huge live display billboard in Las Vegas. But Foursquare has managed to do it. As you can see above, they now have a massive, multi-level and multi-angle display practically screaming about the service to all those in Times Square in New York City. 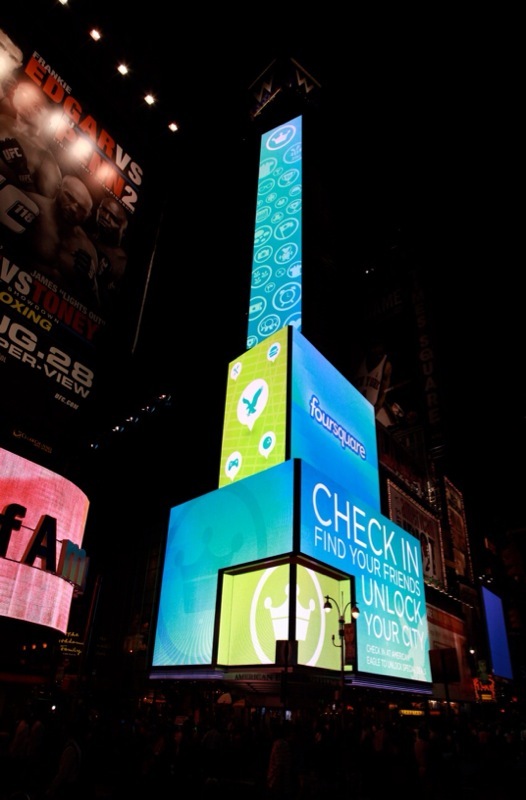 American Eagle or not, this is clearly a huge ad (and a huge win) for Foursquare itself. Walker thanks Foursquare’s designer Mari Sheibley for designing the thing. And hints that a version 2 is coming. The phrase “you can’t buy this kind of publicity” comes to mind — probably because Foursquare, while well-funded, undoubtedly couldn’t buy this type of ad. (American Eagle owns the billboard, Walker tells us.) And yet there it is. This also managed to one-up the big branding rival Gowalla got in New York City earlier this year when they were a part of a massive billboard that loomed large over Madison Square Garden. This Times Square billboard is just about the opposite of a check in off the grid for the service.